I am creating this curated list of Native responses to what happened on Friday, January 18, 2019 at the Lincoln Memorial in Washington, DC. Everyone involved in the moments at the end of the march was in DC for a political reason. 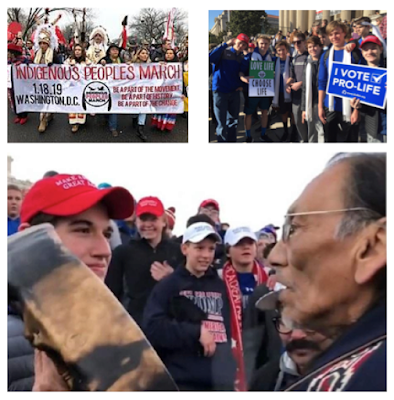 Many people are calling Nathan Phillips an activist, but the students from Covington Catholic School were also there to participate in a political march. They, too, are activists. Many Native people are frustrated with the media coverage. Initial reports condemned the boys but that quickly turned to criticism of Phillips. Some writers and professors wrote to those outlets, expressing concern and offering to write something from a Native perspective. They were rebuffed. Some are using their own platforms, and some are using outlets that most people in the US do not read or know about. Some have been asked to be on NPR. The list is arranged, chronologically. Unless otherwise indicated, the items were added to the list on January 24, 2019. If you are Native and have written something you want me to add, or if you read something written by a Native person that you want me to add, please provide the link in a comment. Note at 3:42 PM: I will not publish comments that tell me to "watch the whole video." I watched that whole video on Jan 20. My observations on it are in a long Twitter thread I start on the the 19th. However you choose to characterize the earlier interactions between the Covington students and the Hebrew Israelites is of no consequence. It does not justify the subsequent behaviors towards Nathan Phillips. Regardless of what happened before Mr. Phillips approached the boys, doing the tomahawk chop and singing the tune that goes with that action, is stereotypical and inappropriate. Cultural Survival: "We Are Still Here!" Indigenous Peoples March is Heading to D.C. The article is co-written by Kelly Holmes of the Cheyenne River Reservation. Indian Country Today: The Nathan Phillips incident: A long day of worldwide news and a school apology by Vincent Shilling, Akwesasne Mohawk, and associate editor at Indian Country Today. 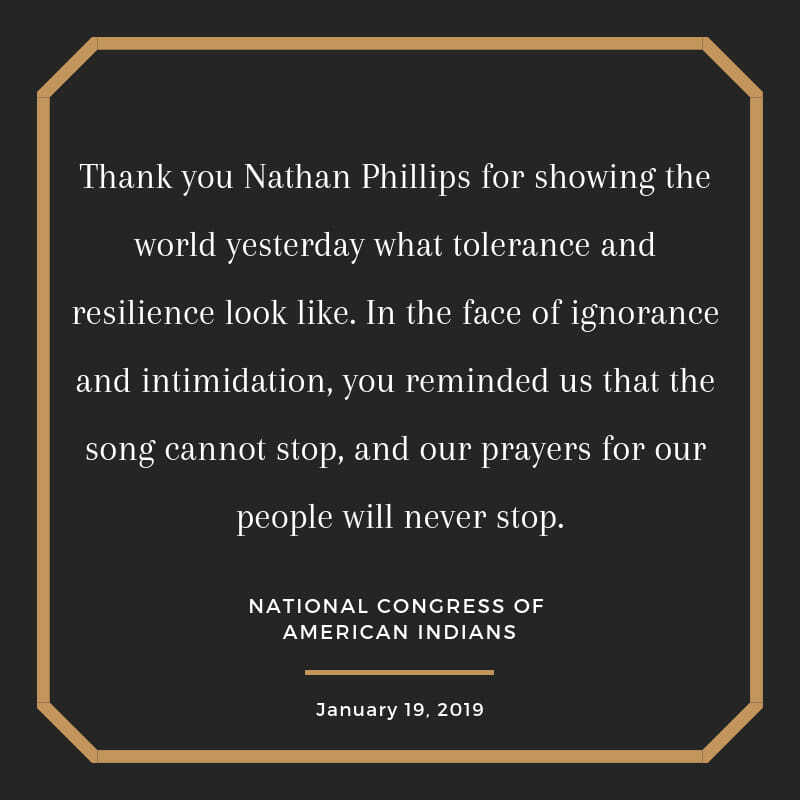 On Facebook: The National Congress of American Indians posted this graphic that says "Thank you Nathan Phillips for showing the world yesterday what tolerance and resilience look like. In the face of ignorance and intimidation, you reminded us that the song cannot stop, and our prayers for our people will never stop." Note: for lists of books for children and teens, see AICL's Best Books lists. With very few exceptions, they are books by Native writers, including Louise Erdrich. 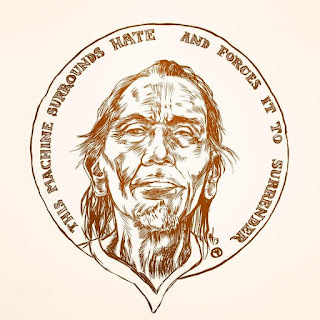 Indian Country Today: Yakama Nation Chairman [JoDe Goudy] on Covington Catholic boys' hatred towards Native elder. Splinter: The Smile Is What Stays With You by Nick Martin, Sappony. The Hill: Haaland condemns students' behavior towards Native elder at Indigenous Peoples March. Haaland is a member of Laguna Pueblo. Native News Online: The Story of Two Videos at the Lincoln Memorial with American Indian Elder Singing is by Levi Rickert of the Prairie Band Potawatomi Nation. Indian Country Today: A Summary of Indian Country Today's coverage on Nathan Phillips and #MAGAyouth by Vincent Shilling, Akwesasne Mohawk, and associate editor at Indian Country Today. On Facebook: Dina Gilio-Whitaker's (Colville Confederated Tribes) response to to an article in The Atlantic (includes link to the article). NY Daily News: Native Elder Nathan Phillips reflects on his stare down with Kentucky students and the lingering legacy of white privilege includes an interview with Nathan Phillips (Omaha) conducted by Theresa Braine, who is not Native. MSNBC: Organizer of Indigenous Peoples Day March responds to viral video is an interview with Tara Houska, Couchiching First Nation. Democracy Now: "I Was Absolutely Afraid": Indigenous Elder on "Mob Mentality" of MAGA Hat-Wearing Students in D.C. is an interview of Nathan Phillips, Omaha. NPR's On Point: In Our Viral World, A Closer Look at Teen's Confrontation with Native American Elder. Guests include Tristan Ahtone of the Kiowa Tribe. He is the president of the Native American Journalists Association. Second guest is Jacqueline Keeler, member of the Navajo Nation, on the board of the Native American Journalists Association. Native News Online: Leonard Peltier on the Elder Singing AIM Song at Lincoln Memorial; Breaks Down Songs Origin. CBC: Two photos: Different times, same outrage by Dan David Taiorenhote, Mohawk. Bad NDNS: "First" Encounters by Deborah A. Miranda, Ohlone/Costanoan Esselen Nation. Sojourners: The Voices of Indigenous People Continue to be Silenced by Kaitlin Curtice, enrolled citizen of the Potawatomi Citizen Band Nation. 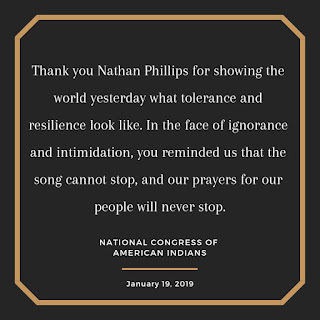 The Globe and Mail: The confrontation between the Covington students and Nathan Phillips is America, laid bare by Niigaan Sinclair, Anishinaabe (St. Peter's/Little Peguis). Pacific Standard: Why the video of the Catholic boys felt so shameful by Terese Marie Mailhot, Seabird Island Band. Medium: An Open Letter of Apology to Native Americans From One of the Covington Catholic School Students (note: this is not by one of the student; rather it is what we imagine they could say) by Tiffany Midge, enrolled citizen of the Standing Rock Sioux. The Star: Indifference and disrespect are constants in the lives of Indigenous peoples by Tanya Talaga, Anishinaabe. Native America Calling: Face-to-face with disrespect included four individuals who were in DC for the march: Quese Imc (Pawnee/Seminole) – hip hop emcee and independent music producer, Nathan Phillips (Omaha) -U.S. Marine Vietnam Era Veteran and Elder, Lance Gumbs (Shinnecock Indian Nation) – a senior trustee and councilman of the Council of the Shinnecock Indian Nation and the regional vice president of the National Congress of American Indians, and Kansas Middletent (Lakota) – ambassador for Native Hope. The fifth guest was Dr. Marisa Duarte (Pascua Yaqui Tribe) – assistant professor of Justice and Sociotechnical Change in the School of Social Transformation at Arizona State University. Think Progress: I know what I saw when I watched the Covington video by Rebecca Nagle, a citizen of the Cherokee Nation. The Guardian: The US is still not ready to look at the ugly racism against Native Americans, by Julian Brave NoiseCat, member of the Canim Lake Band Tsq'escen and a descendant of the Lil'Wat Nation of Mount Currie. The Daily Beast: The History of the Covington MAGA Teens' Racist 'Tomahawk Chop' by Robert Silverman includes comments from Amanda Blackhorse and Jacqueline Keeler. Both are members of the Diné or Navajo Nation. Sierra Club: "Land Gets Stolen. That's How it Works." What happened at the Lincoln Memorial proves most Americans are still not hearing the Native American experience by Jacqueline Keeler, member of the Navajo Nation. NPR's Code Switch: The Fight for Native Voices To Be Heard is Audie Cornish's interview with Jacqueline Keeler, member of the Navajo Nation. Truthout: The MAGA Boys are Racist Brats by Kelly Hayes, member of the Menominee nation. CNN: America mocks and dehumanizes natives at ever turn by Simon Moya-Smith, Oglala Lakota and Chicano. UPROXX: How It Feels To Be An Indigenous American At This Moment In History by Zach Johnston, Skokomish Indian Reservation, Twana (təw'ánəxʷ) people. Cartoons and Caricatures statement by the Native American Rights Fund. 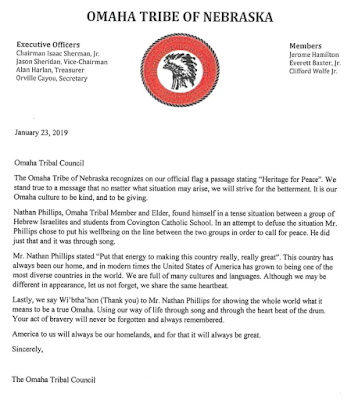 Last Real Indians: Nathan Phillips Offers to Meet with Covington Catholic High School Students by Matt Remle, Standing Rock Sioux. NBC News Think: Noah Berlatsky's Nick Sandmann, a student at Covington Catholic, says he was a silent bystander in viral video. But his MAGA hat spoke for him includes an interview with Chase Iron Eyes, Lakota. On Twitter: Kaitlin Curtice (enrolled citizen of the Potawatomi Citizen Band Nation) does an analysis of interviews of Nathan Phillips on Democracy Now and on the Today show. The Intercept: Portraying the MAGA Teens as Victims is an Extension of Native American Erasure by Nick Estes, citizen of the Lower Brule Sioux Tribe. Walking Eagle News [satire]: New 528-year-long video sheds light on confrontation between Indigenous Peoples, Canada, by Tim Fontaine, Anishinaabe. On Facebook: Beverly Singer of Santa Clara Pueblo, a comment to Debbie Reese's post. Quora: Alex Jacobs, Mohawk, replies to What is the most serious or wrong part of what students from Covington Catholic School did to an elderly Native American? Splinter: The Smearing of Nathan Phillips by Nick Martin, Sappony. Rewire: What Covington Catholic Students Should Know About the Church's History with Indigenous People by Mary Annette Pember, Ojibwe. In addition to Pember's article, consider getting a copy of Jenny Kay Dupuis's book, I Am Not A Number. 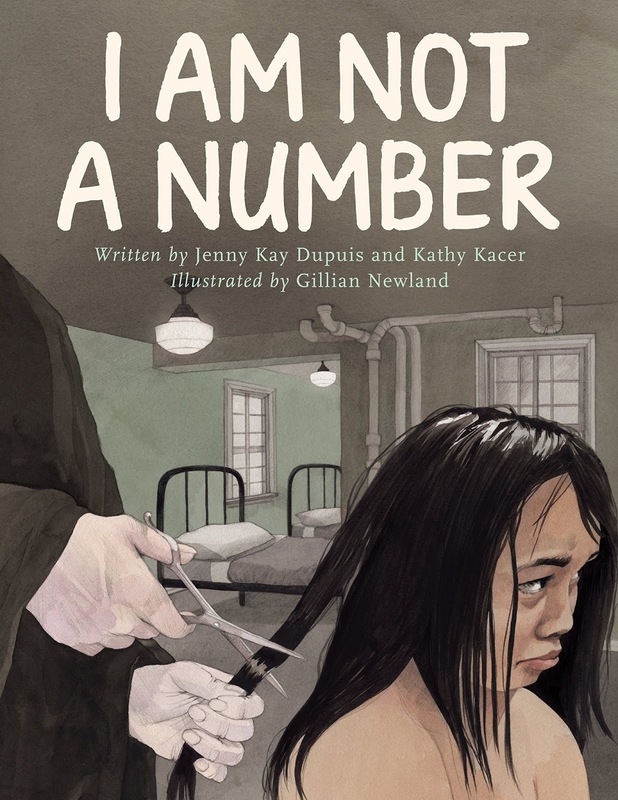 As the figure on the left margin indicates, the book is about a Native child at a Catholic school. The Washington Post: The Mishandling of the MAGA teens story shows why I gave up on mainstream media by Tristan Ahtone, Kiowa. Beacon Press: Cutting to the Chase of the Covington Catholic Fiasco, by Dina Gilio-Whitaker, Colville Confederated Tribes. Bustle: Racism Against Native Americans is Happening Daily & You Need to Know What We Face by Rebecca Nagle, citizen of the Cherokee Nation. 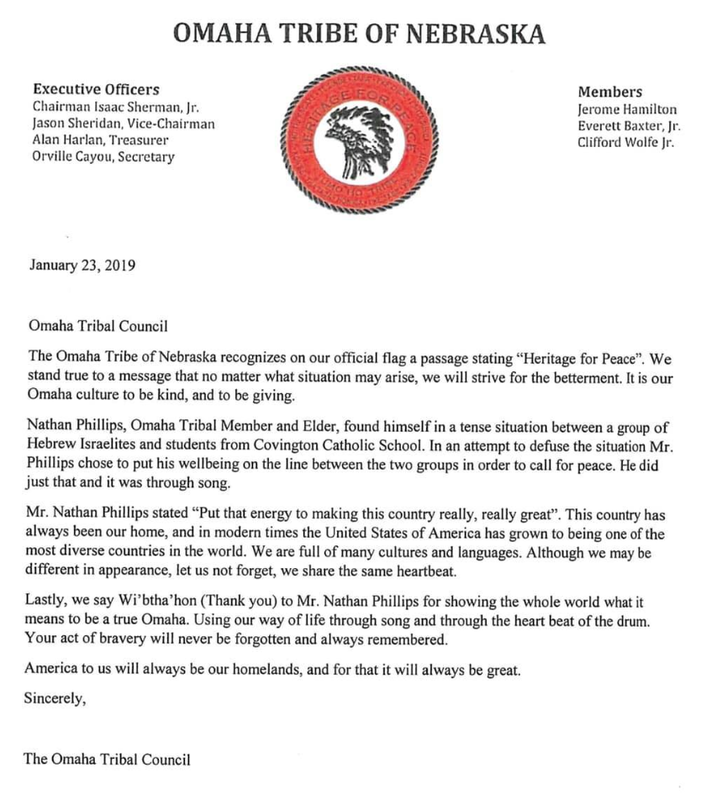 Osage News: Respect by Ruby Hansen Murray (added on Jan 31). The Hollywood Reporter: Indigenous People's Long Road to Visibility in Hollywood by Sierra Teller Ornelas, Navajo. (added on Jan 31). The Guardian: His side of the story: Nathan Phillips wants to talk about Covington by Julian Brave NoiseCat, member of the Canim Lake Band Tsq'escen and a descendant of the Lil'Wat Nation of Mount Currie. (added on Feb 4). Thank you, once again (!) Debbie, for collating and posting these important voices. I am sharing on Twitter. Thank you so much for this comprehensive collection of links! More can be learned at Original Pechanga's Blog: http://originalpechanga.com or at this link: http://www.originalpechanga.com/2016/05/learning-about-disenrollments-links-to.html which has over 50 stories of why the #stopdisenrollment movement is still alive. Thank you for curating these stories. I am dismayed by the number of people in my circle and media outlets, even normally thoughtful ones, who leaped at the chance to excuse these boys with "context" (i.e., whataboutery). I grew up with boys like this in TN, and I know that hideous smirk all too well. Nobody with an ounce of sense or good faith would buy the PR spin that he was just "startled" or whatever. "Many people are calling Nathan Phillips an activist, but the students from Covington Catholic School were also there to participate in a political march. They, too, are activists." Yes! They are activists, being trained and supported by adults, and they were in DC to protest the rights of women to make particular health care decisions. Many of them intentionally wore clothing items that identified both their school and their overall ideology (not just the aspects related to women's health care decisions). The adult activists who helped them attend the anti-choice protest failed to prepare them to manage their excitement and agitation about having been part of a large public celebration of their particular agenda. The adult anti-choice activists at their schools, in their homes, in government, and in the media are now putting money, effort, and noise into protecting them from scrutiny.